Being a wisdom holder is not easy. Most of the Indigenous communities of the world have been victims of genocide, cultural annihilation, racism, human rights abuses and cultural misappropriation. To be able to hold the wisdom of your Peoples, to keep it alive through ceremony and practice, to pass it onto new generations and even be generous in sharing some of that wisdom with the people outside your community, takes takes an enormous amount of dedication, determination, courage and grace. At Sacred Fire Foundation, we recognize the importance of the crucial work that Indigenous elders are doing in keeping their wisdom and their traditions alive. Our Wisdom Fellowship Award aims to honor elders who are keeping the fires of tradition burning, embodying the perspective of this time-tested knowledge that so benefits their communities and humanity at large. 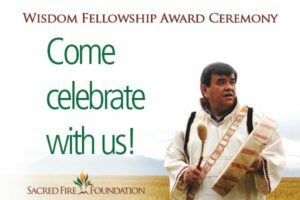 It is with great joy that we will be presenting the 2017 Wisdom Fellowship Award to Unangan elder Ilarion Merculieff on October 10th during a special award ceremony at the David Brower Center in Berkley, CA. Ilarion has served his people, the Unangan (Aleuts) of the Pribilof Islands and Indigenous peoples worldwide, for four decades. In his most recent publication, Wisdom Keeper, he writes about the wisdom of Elders through the lens of his own life. If you would like to join us in celebrating ancestral wisdom and honoring Ilarion Merculieff on October 10th in California, click here to register now. Space is limited.